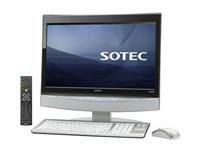 Onkyo has announced its new E702A9 Sotec Media Center PC. The Media Centre PC is paving the way as an ultra compact PC for saving spaces by packaging all the hardware components into one enclosure. Equipped with a 21.5-inch LCD display of 1920 x 1080 resolutions, Onkyo E702A9 is also featured with a 1.3-magapixel webcam and a pair of 8W speakers. It also powered by 2.8GHz Intel Core 2 Duo CPU, 2GB RAM, a 500 GB hard drive that will provide ample space for recording TV programs, running on Windows Media Center edition, integrated 4X Blu-ray recorder, a remote control, wireless keyboard and mouse. In addition, it also can be iPod dock for synchronization and playback device contents, and supports dual-band TV tuner that allows users simultaneously record two TV programs at once. The media center PC is expected to be available in Japan on 7 of March and is priced at about $1840.